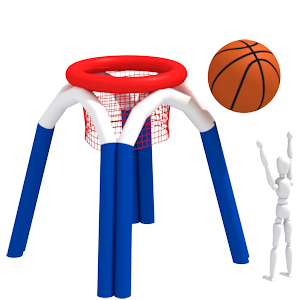 Amusement "Basketball" are included the inflatable basket and ball. 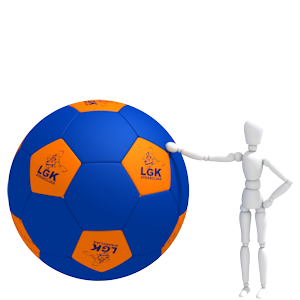 The diameter of ball are 80 cm. Basketball can be used as part of sports relay or as a separate attraction. Amusement "Cow" is a milker race for 1 - 2 player. The competitors do milking on time- which makes more milk. Milk fluid can be replaced according to participants choice. Amusement "Crazy feet".. Participant must track the distance by putting feet exactly on the marked prints.Competitions are held on time and on mistakes awarded penalty points. Amusement "Whirligig". Game is used by two players simultaneously. Wins the one who pulls his opponent out of marked area. 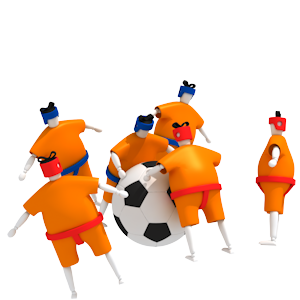 Sports game "Goalkeeper". 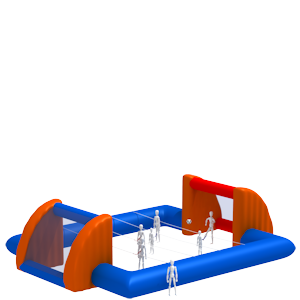 Into the inflatable gate is an imitated goalkeeper with a different value targets. The challenge is to hit the ball the holes with the greatest point value. 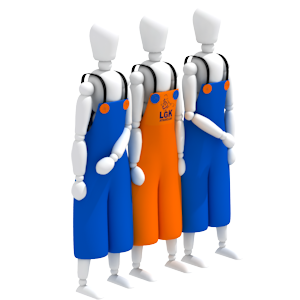 Amusement "Triple-pant" is a three shorts sewn together that are used by three players together make various tasks. Amusement "Pillow battle" is the inflatable amusement for two members. The challenge is pillow fighting by balancing in sitting position on the center beam. Do not use this amusement without supervision! Amusement „Team skiing” for five users simultaneously. The challenge is to accomplish a distance without falling, by making steps is one rhythm. If one falls- everybody falls! 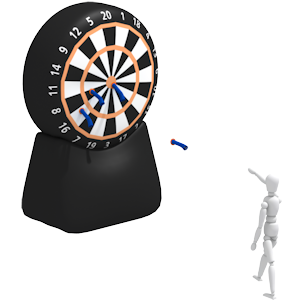 Amusement „Giant darts".. Set includes darts and inflatable target. Both, darts and the target is equipped with Velcro Strap, which provides adhesion. 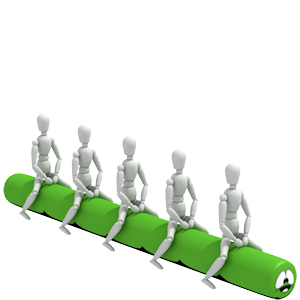 Amusement "Tie" is exciting team game where you can simultaneously participate in up to 2 - 5 players. 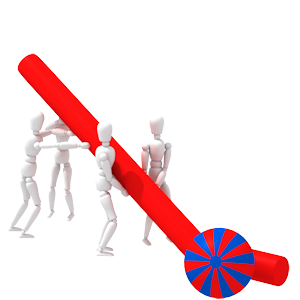 The game is the team jumping, move forward to a specified purpose. 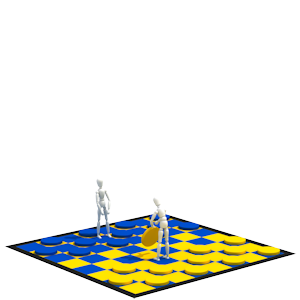 Sports game "Checkers". The area is 5x5m large. Game for everyone who knows the rules or wishes to learn. Can be played group against a group or each with its own kernel. Amusement "Baby ball" is widely applicable, to restrict freedom of movement in various sports games and relay races. It is an opportunity to return to the age when You make a first steps. 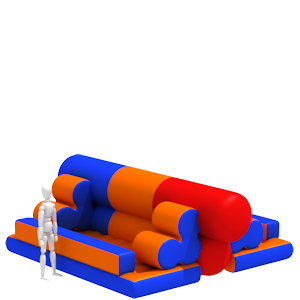 Sports game "Power Test" is stretching the rubber inflatable mattress in opposite directions. Participants stretch the rubber, each on his side. The challenge is to reach the cone at the end of field and put ring on the cone. 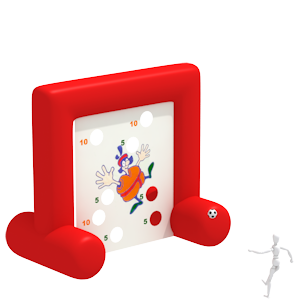 Sports game "Football" is a team game (5 +5 players), formed after the game "Table Football" principle and with inflatable sides and gates. Very fun team game! 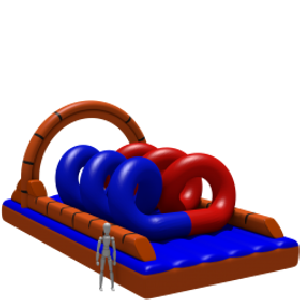 Amusement "Barrel" is the inflatable amusement with several holes with different point values. 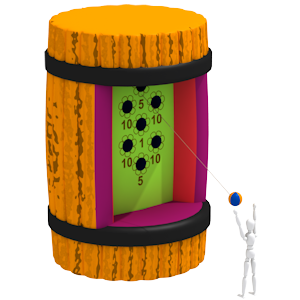 Participant must hit the target with the greatest possible amount of points by pulling and releasing the ball. Sports game "Push Ball". It may be used for different games and relays. Amusement "Skatechair". 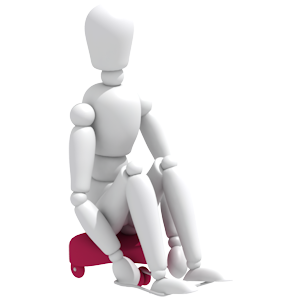 Participant are sitting on the specific device and moving forward with the force of hands. Attraction is used only on smooth surface. Price is per device. 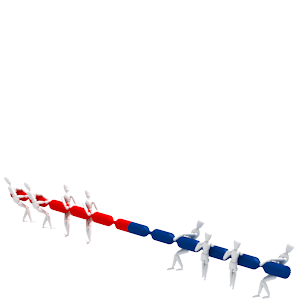 Sports game „Tug of War”. Make ordinary rope - pulling fun! 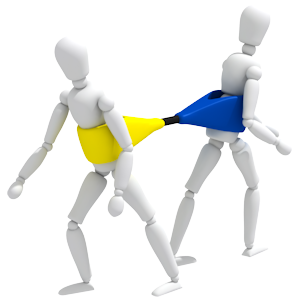 By pulling Tug of War players hands will not be hurt. It is suitable for players of different ages. 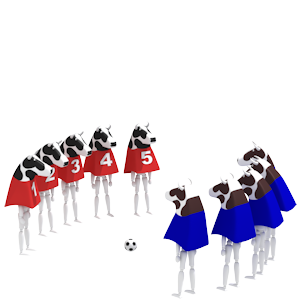 Sports game "Bull-Ball" a soccer outfits with limited visibility. Package includes ten costumes (5 +5) and soccer ball. Viewers will have a very funny performance! Amusement „Bungee Run”. 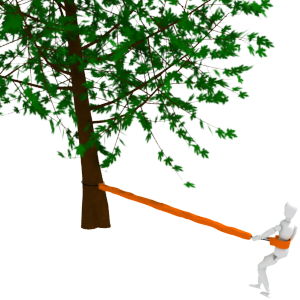 At one end the rubber rope is fixed to a stable tree or pole, the other has a special belt which is fastened around the participant's waist. 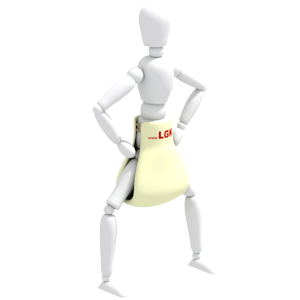 Participant's task is to reach out to maximum further point or get at awards. 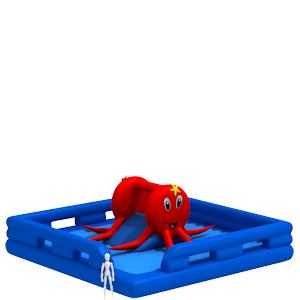 Inflatable bouncer "Octopus" is the fairly big inflatable attraction for 8-12 preschool children . In the center of the attraction is a slide. The octopus is streching his tentacles over the whole area. 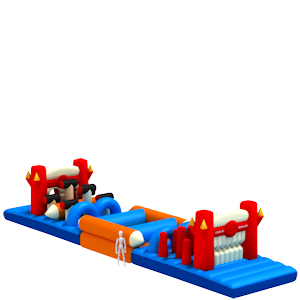 Rubber are inflatable stretching along the tracks in amusement "Bungee run". The stretching rubber put a pit at a distance scale to determine the winner. Two members can compete play against each other at the same time. 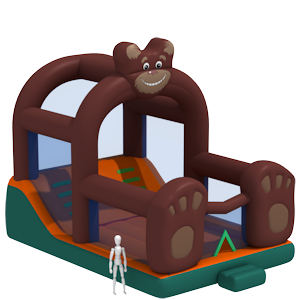 Slide- Inflatable bouncer "Bear" is the inflatable attraction for 6 - 8 children. Inside the bear is a slide which provides both, climbing and sliding joy. 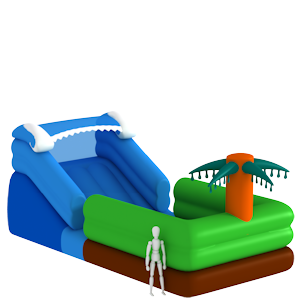 Inflatable bouncer "Mini tsunami" is a small, easy to install an inflatable attraction with the slide, for 4-6 children. Amusement „Magic bicycle”. 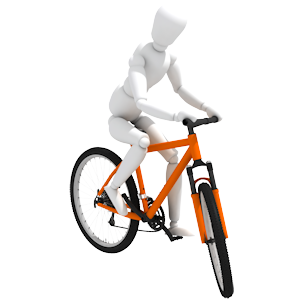 Bicycle steering system are modified and the wheel rotates in opposite direction. 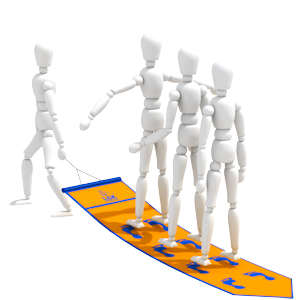 Team building attraction that will bring fun in any event. 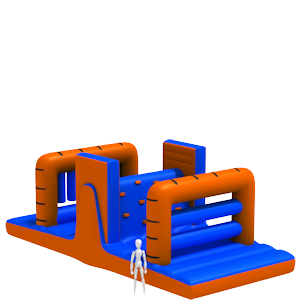 Inflatable obstacle course "Inquisition" is the inflatable obstacle course for 2 players can start simultaneously. The participants are overcoming various pour, climbing obstacles and pushing challenges all the distance along. We guarantee the positive entertainment for children 's birthdays, adult party and sport events. 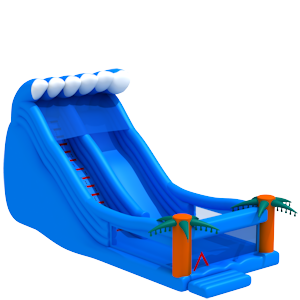 Slide- Inflatable bouncer "Tsunami XL" is the big inflatable attraction with slide for 6 - 8 children.. At the foot of the slide a palm garden is waiting for the children, where they can prepare for the next unforgettable slide. 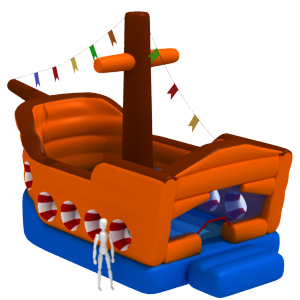 Inflatable bouncer "Pirate ship" will provide unforgettable moments for 5 - 10 children. The ship has wide portholes, so that children can share impressions with their parents outside. There is a small slide and crowd of pirates inside to raise additional fun. 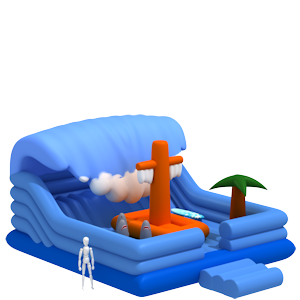 Inflatable bouncer "Mexico" is the inflatable attraction for 8 - 14 children.There is a slide with sombrero hats installed inside the attraction. Is will bring exotic breath in all feasts. 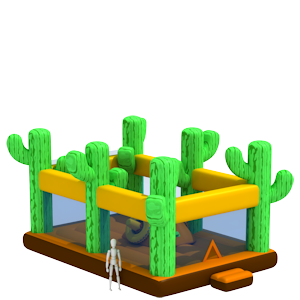 The harder participants bounce, the more intensive the giant cactuses swing. 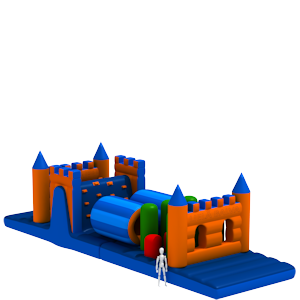 Inflatable obstacle course "Country Yard" is the inflatable mild obstacle course for 2 children can start simultaneously. Wonderful, easily traversed band, which also fits smaller children. Participants must cross the beam zone, crawl through the central barrier and must get through a crowd of sheep. 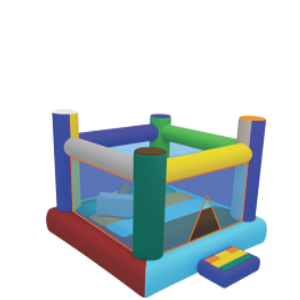 Inflatable obstacle course "Tiger" is the inflatable obstacle course for 2 players can start simultaneously. The participants are overcoming various pour, climbing obstacles and pushing challenges all the distance along. We guarantee the positive entertainment for children 's birthdays, adult party and sport events. 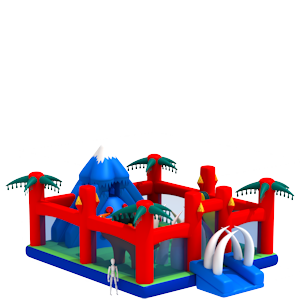 Inflatable obstacle course "Zelta Zivtina" is the inflatable obstacle course for 2 players can start simultaneously.Amusement is made for popular school sports event "ZZ championship". Participants lien through the tunnel to pass through the sneakers, push between the pencils, rulers, and phones and leave amusement along the narrow exit. We guarantee the positive entertainment for children 's birthdays, adult party and sport events. 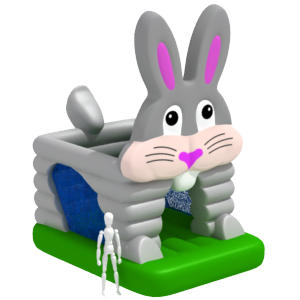 Inflatable bouncer „Rabbit” is the small inflatable attraction for 4-8 children. Attraction is in a form of bunny. The long ears are inviting the young bouncers from long distance. 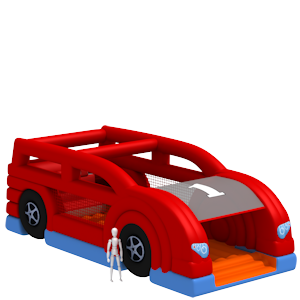 Bouncer "Car" is the inflatable attraction for 6 - 10 children who waiting for all passengers. The giant car is equipped with everything you need to drive safely! 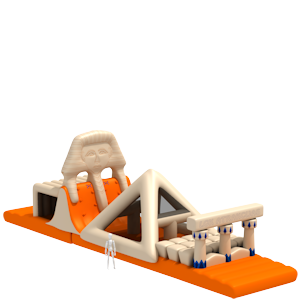 Inflatable obstacle course "Egypt" is the inflatable obstacle course for 2 players can start simultaneously. Participants push through sphinxes fingers, then climb over wall and enter pyramid, where a mummy expects them. 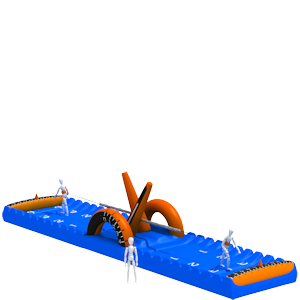 After that comes obstacle course which simulates the sinking sand and finally the finish gate. We guarantee the positive entertainment for children's birthdays, adult party and sport events. 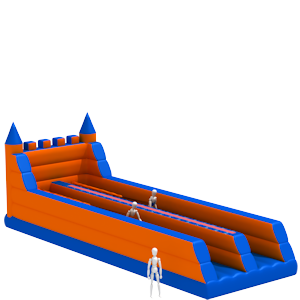 Inflatable obstacle course „Grand Prix 2007” is the inflatable obstacle course for 2 players can start simultaneously. The participants are overcoming various pour, climbing obstacles and pushing challenges all the distance along. We guarantee the positive entertainment for children 's birthdays, adult party and sport events. 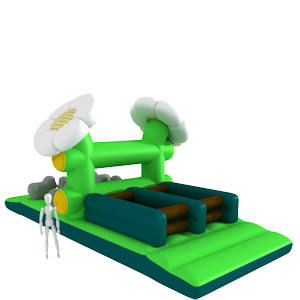 Inflatable obstacle course "Forest Trail" is the inflatable obstacle course for 2 players can start simultaneously. The participants are overcoming various pour, climbing obstacles and pushing challenges all the distance along. We guarantee the positive entertainment for children 's birthdays, adult party and sport events. 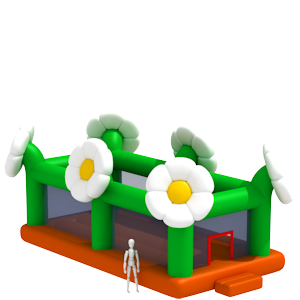 Inflatable bouncer "Flower yard" is the inflatable attraction for 6 - 12 children. Inside the amusement four lambs will be fun playing partners for kids. 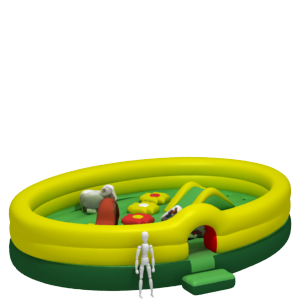 Inflatable bouncer "Meadow" is the inflatable attraction for 6 - 12 preschool children. There are growing flowers in the meadow and pasturing horse, lamb, pig and cow. They all will be great playing partners for young adventure seekers. Meadow is also equipped with a small slide. 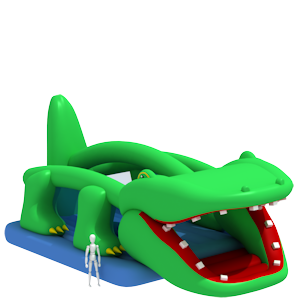 Inflatable bouncer "Crocodile" is the inflatable attraction for 6 - 10 children. Turns out, there are also cute crocodiles, which will bring fun in your garden. In the amusement they will find out that there are two other crocodiles. 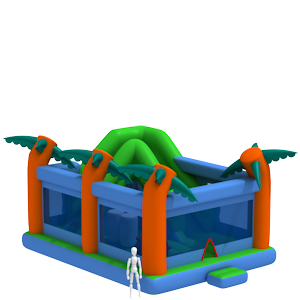 Inflatable bouncer- slide "Dino park” is a spectacular amusement for 8 - 12 children, built on grounds of Jurassic Park. 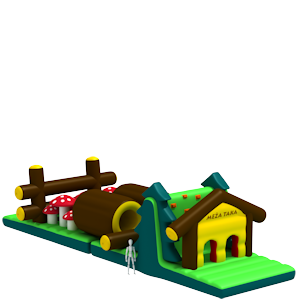 The amusement is equipped with dinosaurs, prehistoric animal bones and mountain with slide. The goal for Dino parks visitor's is to conquer the mountain peak and then enjoy the slide. 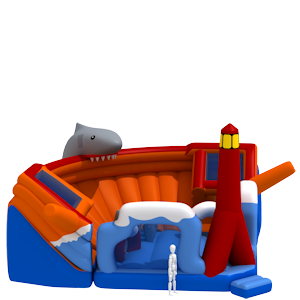 Inflatable bouncer- slide "Broken ship" is the big inflatable attraction for 8 - 12 children . The attraction is designed as a drowning ship. There is money chest, sharks, life rings, slide and giant shark on board of the flooded ship. Amusement can be used for organizing the relay. 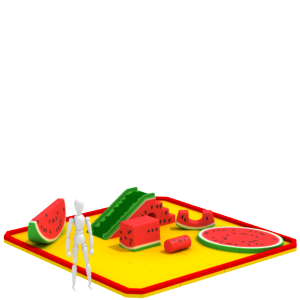 Children's play area "Watermelon" are comprised of the few components - porolone-filledslides, puzzles, and different shapes. This play area can be use 6-10 children together. 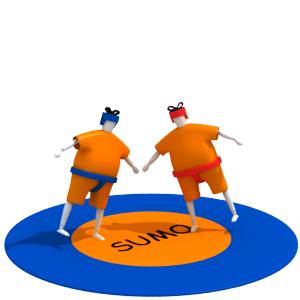 Amusement "Sumo" is a sporty game simulating a sumo fight. 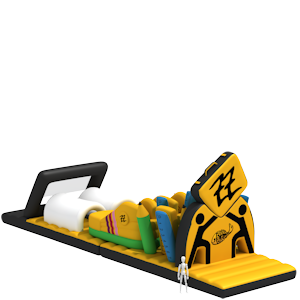 The set includes two sumo suits, two helmets and carpet. The aim is to push the enemy outside the mat borders. 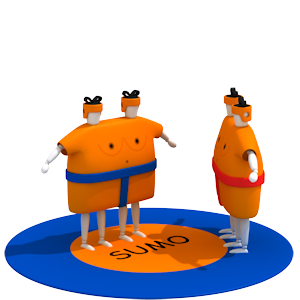 Sports game „Sumoball” is a sporty game simulating a sumo football. 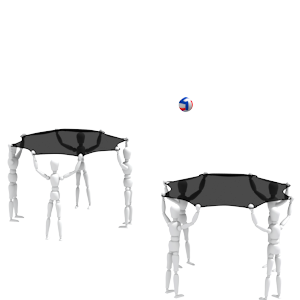 Set includes six sumo suits (3+3), six helmets, and a huge ball. 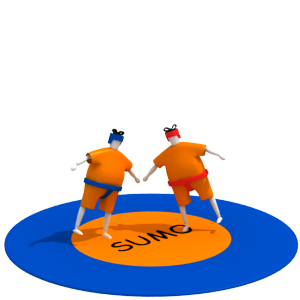 Amusement "Siamese sumo" is a sporty game simulating a sumo fight. The set includes two double suits, four helmets and a carpet. Every suit is weared by two people. The aim is to push the enemies outside the mat borders. 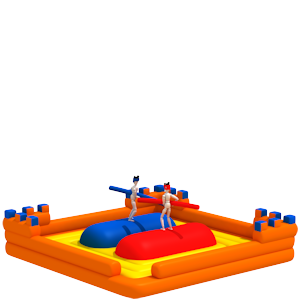 Amusement "Kids Sumo"is a sporty game simulating a sumo fight for small players. 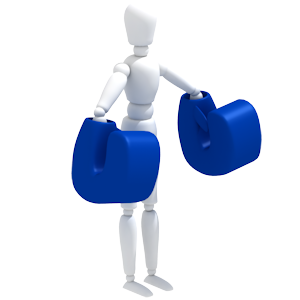 The set includes two sumo suits, two helmets and carpet. The aim is to push the enemy outside the mat borders. 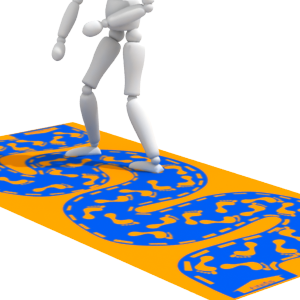 Sports game „Volleyball towels” is intended for 4-8 players. Amusement are includes a ball and two towels. Team catch the ball with towel and throw it to their opponents over the net.